As temperatures in the Northeast drop below 40 degrees, so begins the migration of the wealthy to their seasonal homes to wait out winter. Perhaps the most famous of these destinations is Palm Beach. Part of an 18-mile barrier island in Southeastern Florida, the town is known for its pristine beaches, mega-yacht clubs, five-star restaurants, PGA-rated golf courses, and elite equestrian facilities. For more than a century, Palm Beach has attracted and played host to the world’s rich and famous. While there, these “snowbirds” generate millions for charity and the local economy. As a result, charitable organizations have come to recognize Palm Beach as a philanthropic hub for the cultivation and stewardship of major donors. Palm Beach became a popular playground for the rich in the 1890s when American industrialist, Henry Flagler (1830-1913), financed the extension of the Florida East Coast Railway south to West Palm Beach and began building luxe hotels like the Royal Poinciana Hotel and The Palm Beach Inn (now The Breakers Hotel). 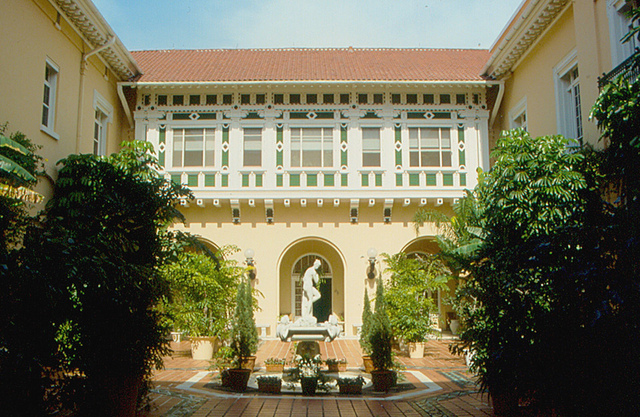 Flagler made it fashionable and comfortable for Gilded Age aristocrats to spend the winter months in the warmth of Palm Beach by offering lavish accommodations in his hotels and private railcars and by hosting extravagant parties at Whitehall, his estate on the eastern bank of Lake Worth. These gatherings brought the affluent and powerful together over sumptuous meals, bottles of the finest champagne, and the best in live entertainment. One could argue that Henry Flagler was the father of the Palm Beach “season,” the period from late November until May when the town hosts a frenetic schedule of art exhibitions, cultural and sporting events, and of course – charity galas! During the season, national charitable organizations host luncheons, golf tournaments, auctions, and galas to engage current and potential donors who maintain seasonal residences in the area. Some organizations, like Dana-Farber Cancer Institute (Boston, MA), the Leukemia & Lymphoma Society (Rye Brook, NY), and American Humane Association (Washington, DC), even maintain satellite offices in Palm Beach to support regional outreach and philanthropic efforts. Because of the overwhelming number of charitable events hosted on the island each year, the Town of Palm Beach has enacted strict regulations to protect residents from fraud and over-solicitation. According to an August 27, 2017 article in Palm Beach Daily News, “Regulations allow individuals or organizations to host up to two fundraisers a year on the island. They must apply to the town clerk’s office for a charitable solicitation permit for each event.” Charities must also register with the state, disclosing their identities, mission, and intended use of donations. Yet, successfully completing the permitting process is only half the battle. Choosing and financing the perfect venue can be quite the undertaking. On-island venues that can accommodate 200+ guests are limited, expensive, and often come in the form of private clubs. Perhaps the most famous of these venues is Mar-a-Lago, the 128-room, 20-acre estate built by cereal heiress Marjorie Merriweather Post between 1924-1927 and purchased by President Donald Trump in 1985. The property served solely as the personal residence of the Trump family until 1995 when Mr. Trump created the Mar-a-Lago Club, a members-only club featuring guest rooms, three dining areas, a beach club, and other hotel-style amenities. Since the Trump family maintains a private residence on the estate, members have the chance to rub elbows with the First Family. To join the Mar-a-Lago Club, prospective members must be sponsored by a current member in good standing. Once approved, new members are required to pay a $200,000 initiation fee and $14,000 in annual dues. The club currently caps the number of active memberships at 500. Can’t afford the membership? Don’t worry! You can still have your charity’s event there. The Trumps operate a banquet business providing access to the club’s facilities, including the 20,000-sq. ft. Louis XIV-style White & Gold Ballroom. According to a June 23, 2017 article in The Washington Post, luncheons at the club can cost a charity $40,000 or more, while a nighttime gala during the season can cost $250,000 or more. In light of President Trump’s current stance on immigration, international aid, and healthcare, as well as the controversial statements he made regarding the August 2017 violence in Charlottesville, many charities (both of their own volition and under pressure from donors) have opted to move their events from Mar-a-Lago to alternative venues. – Since the 2008-09 Palm Beach season, Mar-a-Lago has hosted an average of 38 events each year. – In June 2017, 25 events were scheduled for the 2017-18 season. – As of September 21, 2017, the number of events had dropped down to 3. High-profile charity events such as Dana-Faber Cancer Institute’s Discovery Celebration, the American Friends of Magen David Adom’s Celebration of Life Gala, the Salvation Army’s Holiday Snow Ball, and the Leukemia & Lymphoma Society’s Annual Gala were moved all to The Breakers Palm Beach, a 140-acre oceanfront resort featuring 538-room hotel, 4 ballrooms, 9 restaurants, and multiple function/meeting rooms. Some organizations took a change in venue as an opportunity to think about their event in an entirely new way. For example, the Susan G. Komen Foundation opted for a cruise ship event to the Bahamas for its annual Perfect Pink Party. Others, like the American Red Cross, canceled their event entirely. Regardless of venue (or politics), the Palm Beach season remains an integral part of the fundraising strategy of numerous high-profile non-profits. Events held during this period help organizations carve themselves a niche in the Palm Beach social scene and generate millions of dollars in donations. According to a September 18, 2017 article in The Washington Post, “Some of the biggest charity galas can attract 600 people or more and raise more than $1.5 million…” For example, in 2016-2017, Dana-Farber Cancer Institute’s Discovery Celebration reportedly raised $2.2 million, the American Friends of Magen David Adom’s Celebration of Life Gala raised $1.4 million, and Susan G. Komen’s Perfect Pink Party raised $1.3 million. It will be interesting to see if these non-profits maintain or quite possibly even increase fundraising levels in their new venues after shaking up their established traditions and re-thinking what the events can be. Kessler, Ronald. The Season: Inside Palm Beach and America’s Richest Society. Harper Collins, 1999.